Venezuela depends on oil sales for over 95% of its export earnings, with the hard currency being used to pay for imports, social programs, external debt and arbitration settlements. As a result the decrease in the price of oil this year has been viewed with concern. 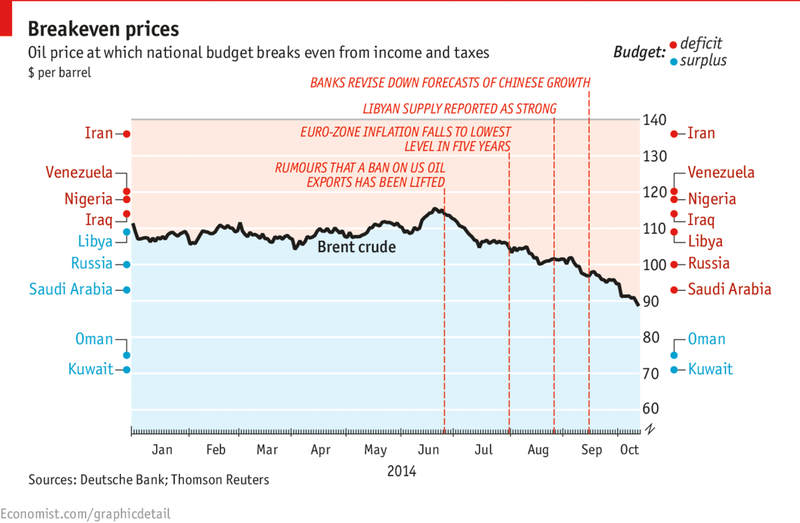 Brent crude has fallen from a previously stable US $105 in July down to $78 currently. Lower oil prices are an additional strain on Venezuela’s ailing economy. But $75-80 oil won’t send the country into default...yet, but the D-word is being whispered by some analysts. Venezuela will earn $16 billion less in 2015 than this year because of the decline in oil prices, At current spending rates, Venezuela needs oil to rise to $110 a barrel to balance its accounts, Jefferies Group LLC Latin America analyst Siobhan Morden wrote in a Nov. 12 note to clients. But according to DB-Thomson Reuters it's $120. Venezuela has the largest oil reserves in the world, according to BP, and its debt metrics do not suggest financial distress. For example, gross debt is less than half the country’s $209bn annual economic output. Yet Venezuelan sovereign debt is among the highest yielding in the world, at more than 18 per cent. Venezuela’s debt has been the emerging world’s worst-performing over the past 12 months, according to Bloomberg. The economy will shrink 3 per cent this year (2014), according to International Monetary Fund forecasts, and the government is running a fiscal deficit equivalent to 14 per cent of GDP, financed by money printing. Oil accounts for 95 per cent of export revenues, and two years ago these were enough to finance $77bn of imports. In the coming year, forecasters estimate the country will be able to finance only $51bn of imports. However, president Nicolas Maduro is committed to servicing Venezuela’s external debt and he has room to maneuver: Venezuela will likely implement a managed devaluation of its currency and unlock additional liquidity from things like asset sales and changing the terms of its loans with China. Caracas can handle the economic pain for now, without ushering in social dislocation or political upheaval that would make the military withdraw its support for Maduro. A shifting energy landscape will make Venezuela dramatically more dependent on China. Venezuela relies on loans ($50 Bn since 2006) from China that it repays in future oil exports; pushing for more lenient terms of these loans is part of Caracas’ strategy for dealing with the recent oil price drop. Reuters is reporting that Venezuela’s foreign minister Rafael Ramirez is touring a number of oil producing nations in a bid to prevent a further fall in oil prices that could squeeze the South American country’s finances. In the long run, it’s very clear that Venezuela's overdependence on oil revenue could threaten its survival. To Maduro and his Ministers, economic policy has been limited to decisions on controls, foreign exchange policy and salary increases. While inflation being at 70% this year and shortages that are dramatically increasing, the limited funds available are shifted to covering the immediate needs of the Government. 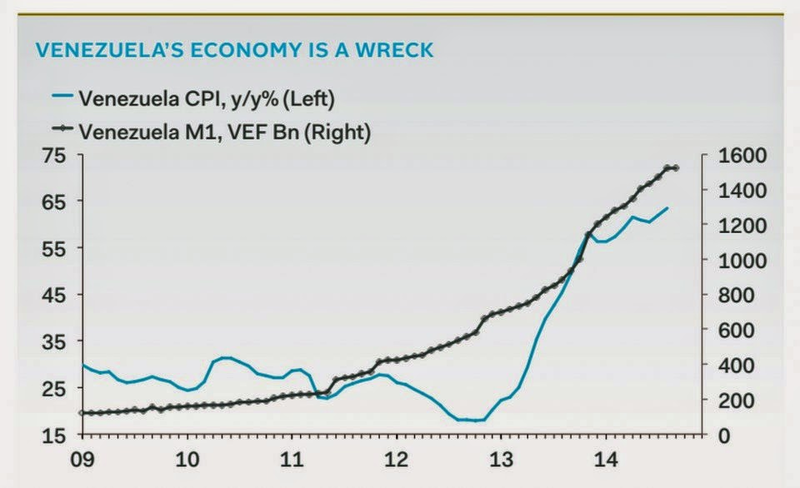 The chart above shows how Venezuelan inflation has exploded. The shortage of dollars in Venezuela to buy imports has also led to shortages of major goods like cooking oil, rice, coffee, chicken, diapers and milk, leading to heavily-protested schemes like fingerprinting customers when they buy groceries to keep track of purchase. Venezuela's economy seems to be on a sliding slope. In the Chavéz era, corruption has been re-introduced on a large scale. Presumably because there was plenty of money and Chavéz wanted to reform fast and because of the applied 'Dutch Disease' policy. President Maduro is forced to continue this road because - unfortunately - he is unable to set things straight. To eliminate the widespread corruption and reform the economy will take at least another 15-20 years. The new wide-spread corruption fed a new 'Boligarchy'-class, also called 'Chavigarchy', 'Boliburgueses' and 'Chaviburgueses'; their offspring is often referred to as 'Bolichicos'. Checkout Univision's report on Boligarchs.